Ambassador Leaders launches an official alumni network designed with students in mind. We know that the bonds our students form with like-minded peers and inspiring teacher leaders are invaluable, and we listened when you asked for a way to stay connected after the summit ends. We’re thrilled to announce the official Ambassador Leaders Alumni Network—ALAN for short. Powered by LinkedIn, the premier professional networking site, ALAN is here to help you level up. Whether you’re searching for your next job, expanding your professional connections, or seeking career advice, your fellow Ambassador Leaders can open new doors. Sounds great, right? You may already have an active LinkedIn profile. If you do, skip down to the next step. If you don’t, visit LinkedIn, enter some basic personal information and—voila!—you’ll have set up your own account. You must be 16 years old to create a LinkedIn profile. If you’re not 16 yet, don’t worry! We’ll remind you to join when you are. 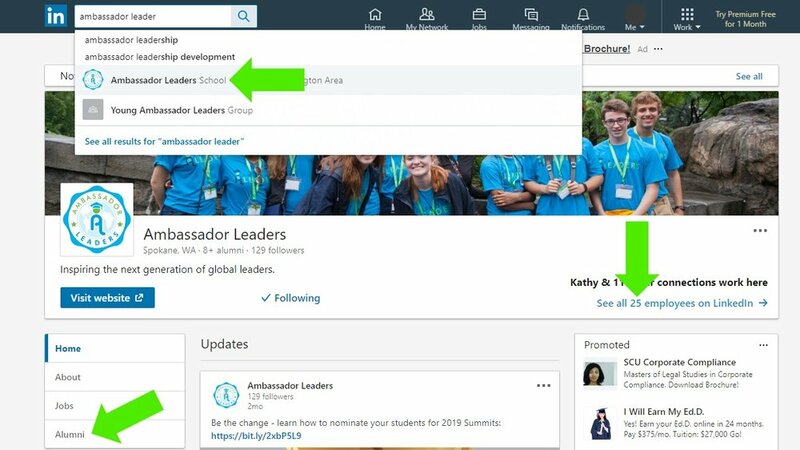 Once you’ve set up an account, add your Ambassador Leaders experience by clicking the ‘Add profile section’ on your page and select ‘Education.’ You can copy all the details we’ve provided below to get started. Degree: Leadership & Community Service. Field of Study: Name of your summit and location. For example: Ambassador Leadership Summit at Harvard. Leave the Grade and Activities & societies sections blank. From year/To year: List the year you attended your summit. Completed intensive leadership development curriculum designed to teach leadership through service. Participated in a rigorous workshop to build personal effectiveness and leadership skills like self-management and leading in a team environment. Collaborated with peers to develop and present a Community Action Plan to address a critical need in communities worldwide. Supported a local community through a hands-on service project. Developed global perspectives while working with international peers. Degree: Leadership, Career Readiness & Service. Field of Study: Name and location of summit. For example: Medicine and Health Care Summit at Johns Hopkins University. Completed focused medical curriculum introducing aspects of the health care industry like medical ethics and patient interviewing skills. Participated in workshops to earn CPR certification, learn the fundamentals of suturing, and learn to measure vitals and reflexes. Collaborated with peers to develop and present a patient case study addressing all elements of diagnosis and a research-backed treatment plan. Supported a local community with a hands-on service project. Hit ‘Save’ and go to step 3! You can now start connecting with other alumni! Now that you have your Ambassador Leaders education experience listed in your profile, you can find and connect with other alumni. Simply search for Ambassador Leaders and click on our logo in the drop-down menu. Once on our page, click on the “Alumni” button in the left-hand menu. There you can find, message, and connect with your fellow alumni. To find teacher leaders, click the ‘employee’ link at the top of the page. That’s it! By following these three steps you can join ALAN, our official alumni network, today and start extending the life-changing experience of the summit into your future. Expand your professional reach. Maximize your competitive edge. Don’t wait—join us!